Located in the East of Indochinese Peninsula, Vietnam enjoys many favorable conditions endorsed by Nature. Beautiful sandy beaches nearby blue sea, towering mountains and fascinating views from the North to the South make Vietnam an attractive destination. Visiting Vietnam, you are taking chance to discover amazing sciences and, at the same time, experience the indigenous culture in the warmest welcome of the local. 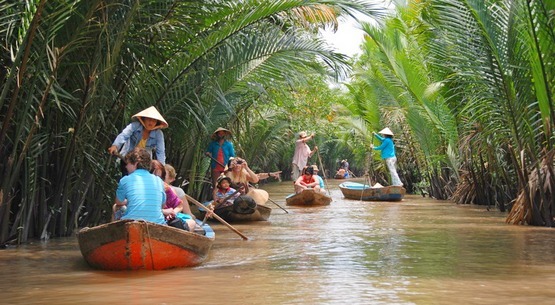 • Explore scenic beauty along the country of Vietnam. 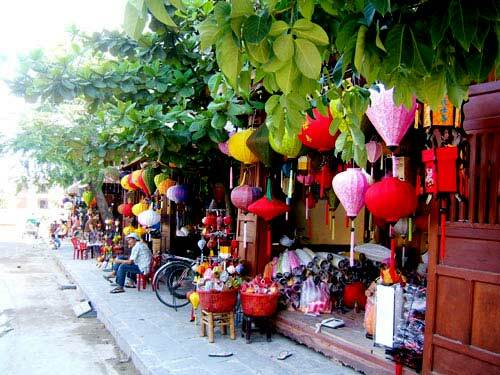 • Discover several ancient heritage sites in Vietnam: Hanoi Old Quarter, Hoi An Ancient Town, the Citadel of Hue. • Have leisure time in spectacular places: picturesque countryside, amazing landscapes, wonderful beaches and islands. • Experience making traditional foods. • Understanding the long history of Vietnam. • Enjoy traditional poetry and romance on the Perfume and the Saigon River. • Relax at beauty spots and enjoying nature with pure fresh air, good weather, friendly local people, native cuisine, etc. Landing in Hanoi, you will be warmly welcomed and transferred to hotel for check-in (the rooms are at your disposal from 14:00). Then, you can freely spend your time on taking a rest in the hotel or going a little sightseeing tour around the city. 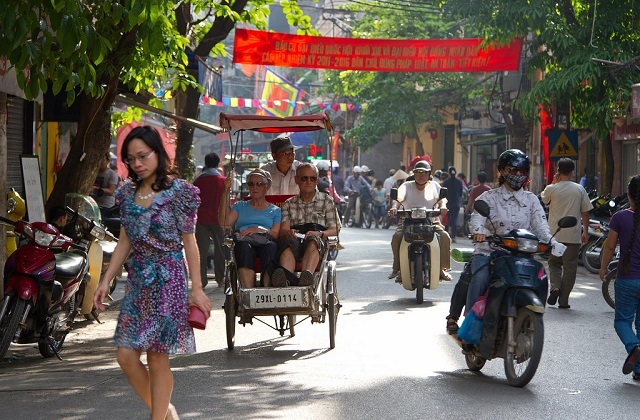 This night out in Hanoi will show you the different facets of the city. Enjoy welcome dinner in a famous local restaurant. Start your city tour with a visit to Ho Chi Minh Complex and the first University of Vietnam called Temple of Literature before lunch at a local restaurant. In the afternoon, you can enjoy the diverse of Vietnamese culture in the Museum of Ethnology. Next, A slow – speed tour on a traditional cyclo will bring you chance to explore the classic and modern features of Hanoi by travelling through the Old Quarter. The Old Quarter is well-known for its history, architecture, products and even the daily life of residents in its 36 old streets and guilds where the name of the street represents products the vendors selling in it. Finally, you will be transferred to Hanoi train station to take an overnight journey toward Lao Cai. 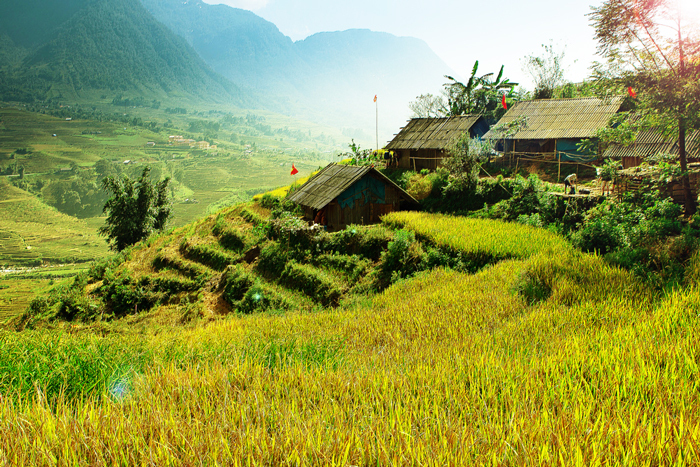 Around 6.00am, you arrive in Lao Cai and then local guides with private car will transfer you to Sapa. 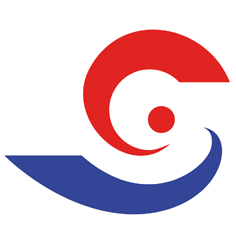 A brief visit Sapa market let you to enjoy peaceful life there. After a while, you will be on your way to Cat Cat village where you stop by a beautiful waterfall, a hydroelectric station and a rice paddy terraces with spectacular sceneries. Arriving in Y Linh Ho village where Black Hmong minority, you take a rest and enjoy your picnic lunch. Next, you visit Muong Hoa valley and pass through another Black Hmong minority, Lao Chai, before taking a trekking route to visit Ta Van village of Giay minority. Finally, a car will take you return Sapa. At 08.30am, vehicles transfer you southwards. 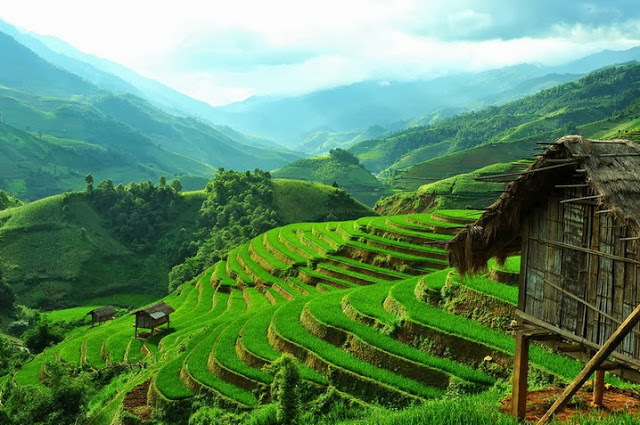 You can enjoy fantastic landscapes of Hoang Lien Son range and terraced rice fields of Muong Hoa valley offered by the first 16km of your journey. You have chance to get off at several photo stops before visiting to Hoa Su Pan, a small hamlet of the Black Hmong in Su Pan Commune. Heading toward further south to Muong Bo valley of Thanh Phu commune, you walk along the large path for nearly an hour to visit several houses on stilts of the Tay people and experience their daily life and hospitality. Then, you take a lunch break in a local home. In the afternoon, a short drive gets you through a rocky road to My Son and you spend about thirty minutes going for a walk in this village of Xa Pho ethnic to see their special custom. Another 10km trip takes you to Nam Cang commune to visit Nam Than village, a village of the Red Dzao minority. After leaving Nam Cang and coming back Sapa, you return Lao Cai for a night train to Hanoi. In early morning, you arrive in Hanoi and freshen up before having breakfast at a mini hotel. About 8.00am, a car picks you up and your 3 and a half hours journey to Halong Bay starts. After a cruise briefing, you embark upon your cruise. 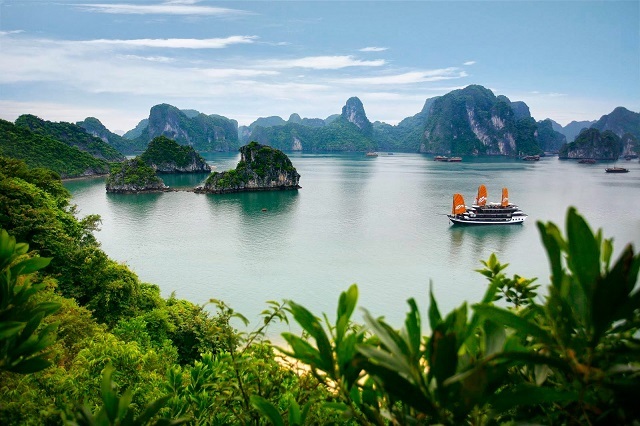 As cruising further along magnificent Halong Bay, you can witness scenic beauty of limestone islands while savoring a leisurely lunch. For a while, getting off the boat to get on a kayak and exploring hidden areas of the bay around Bo Nau Cave. Returning to the boat and heading toward Soi Sim Island. At the Island, you can relax and enjoy swimming or climb up to the top for a vista of Halong Bay. Back to the boat for showering, and you can relax or pose photos while the sun is starting to set. After dining, you freely use your evening to socialize with other guests, dance and do karaoke or experience night squid fishing. Choose Tai Chi exercises or a photo hunt to start your day. At sunrise, your breakfast will be served. 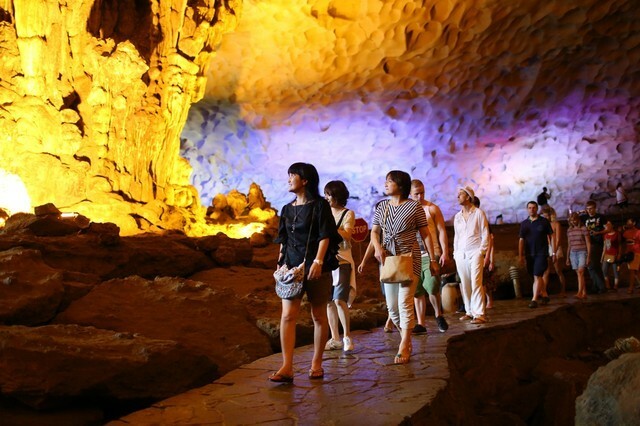 Next, visit the nicest cave in Halong Bay, the amazing Sung Sot Cave. Return to the boat and check out of your cabin. Continue to explore the Bay further, drop by Ba Hang fishing village, Dog Islet, etc. On your way back to the habor, experience a cooking demonstration and then enjoy a traditional Vietnamese lunch. After disembarking, come back to Hanoi for a short fight to Hue. In Hue, our guides and drivers warmly welcome you; they transfer you to your hotel then. Visit Imperial Citadel a UNESCO World Heritage site built from 1805. This masterpiece illustrates Nguyen architecture with ten gateways, a surrounding canal and many specialized buildings inside. 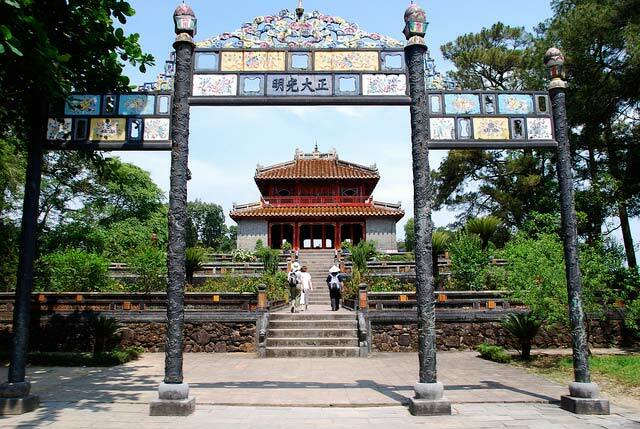 After visiting the Citadel and learning about Nguyen architecture, you will continue your sightseeing with Thien Mu Pagoda which boasts of itself reputation of the most famous religious Buddhist Center in Hue. Enjoy the poetry and romance of the Perfume River while watching the sunset on the riverbanks. Travel to the south, arrive in Quang Nam province, and explore Hoi An Ancient Town, one of the most valuable places of Vietnam. It used to be a bustling commercial port for international merchants came and trades diversifying kinds of product. Though Hoi An has become an attractive destination with many resorts, cafes and other modern building, its classic look still remains. In old and narrow streets, several houses are unchanged from their dawn day. Visiting Japanese Bridge, Phuc Kien Assembly Hall, Phung Hung Ancient House… In addition, Hoi An is famous for its unique traditional foods like Quang Nam noodles, Cao Lau chicken rice and other tasteful dishes. 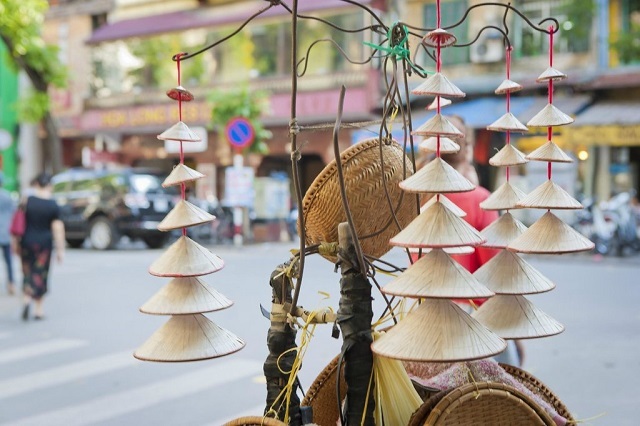 You should take this chance to enjoy Hoi An gastronomy and architecture. 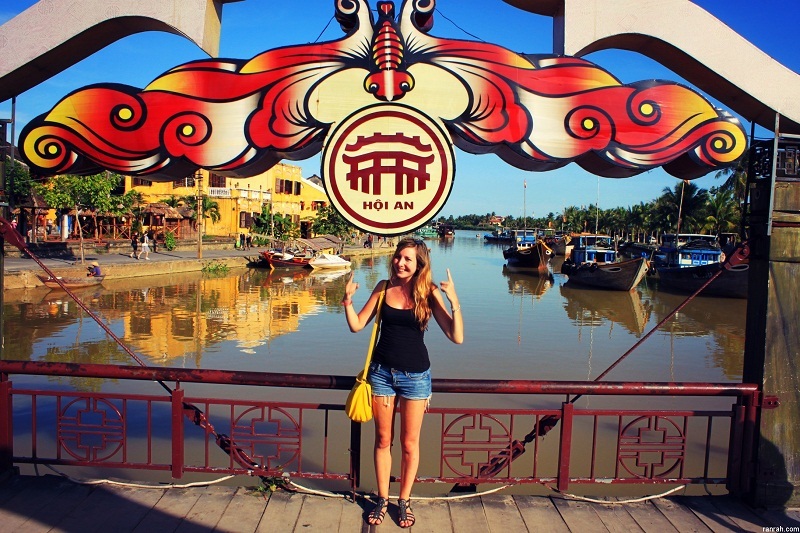 Today is your free time to relax or explore Hoi An town. You might lie on the beach for a sunbath and swimming in cool water. Besides, you can order some suits or clothes made by famous tailors in Hoi An. Or you can do other interesting activities of cooking and tasting special dishes. Overnight in Hoi An. Say farewell to Hoi An, you will be transferred to Danang Airport for flight to Ho Chi Minh City, the most bustle and hustle city in the south of Vietnam. This is one of the must-visit first cities attracting international tourists. 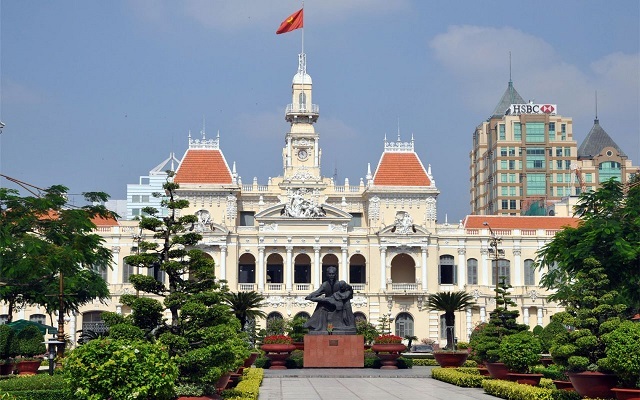 Arriving in Ho Chi Minh City, your whole afternoon is devoted to a guided tour around this exciting city. 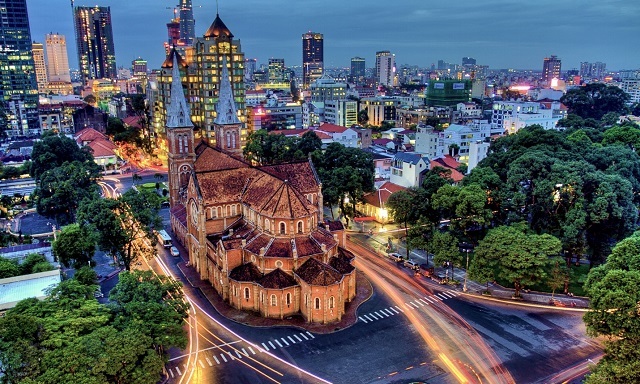 Visit Reunification Palace, the War Remnants Museum and Notre Dame Cathedral before an overnight in Ho Chi Minh City. Cai Be floating market is the first place to visit today. 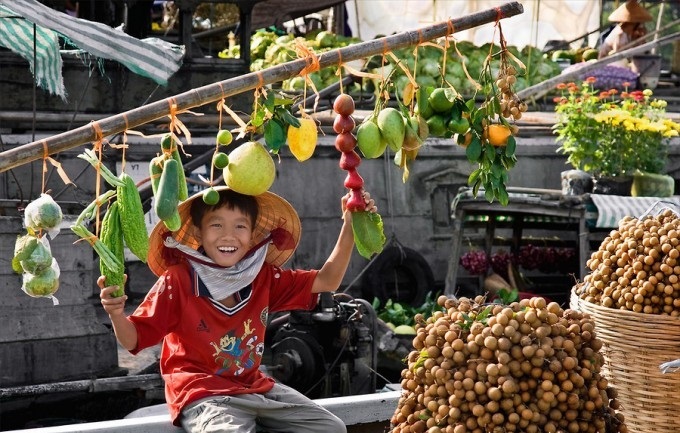 In this special market, you can see many stores on wooden boats selling various kinds of fruits and vegetables. Then, paying a visit to a local workshop gives you chance to learn how to make rice paste, coconut candy and pop rice. Afterward, you stop by a handicraft village to witness the local making rice net for spring roll, fish source and soya source, cooking salt or sewing coconuts leaves. Your lunch will be served in a 170-year-old house. In the afternoon, a traditional rowboat will pick you up to travel around wooden houses lying under palm trees in the Mekong Delta. In this short sightseeing, you are able to see daily activities of local residents like fishing or picking fruits. At a possibly optional stop, visitors can enter a garden where nurses different types of fruits. You are able to enjoy various fruits and explore how the owners produce world famous fruits and vegetables there. Around 3.30pm, the trip ends at Vinh Long town where a car will transfer you back Ho Chi Minh. Having breakfast served at hotel, then you are free at your leisure (rooms are at your disposal until noontime only) before our driver transfers you to the Airport. End of tour services.